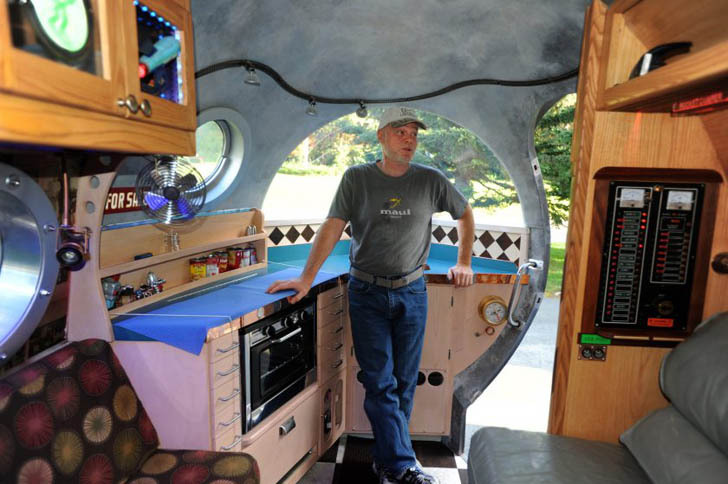 Sidelined by surgery, he spent two years crafting this magnificent homemade camper. When you just have to get “back to the future” this retro inspired, steampunk-esque “Rocket Camper” may be just the inspiration you’re looking for. Exquisitely handcrafted by instructables user longwinters, this fine piece of machinery is built almost entirely of wood. 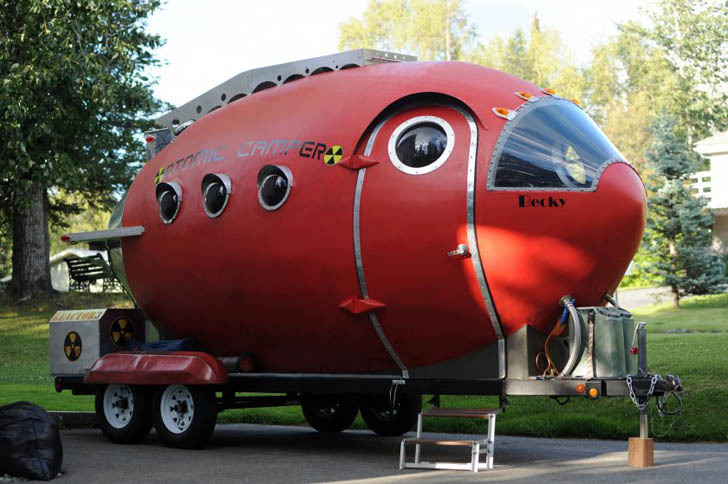 The Atomic Camper in all its glory. 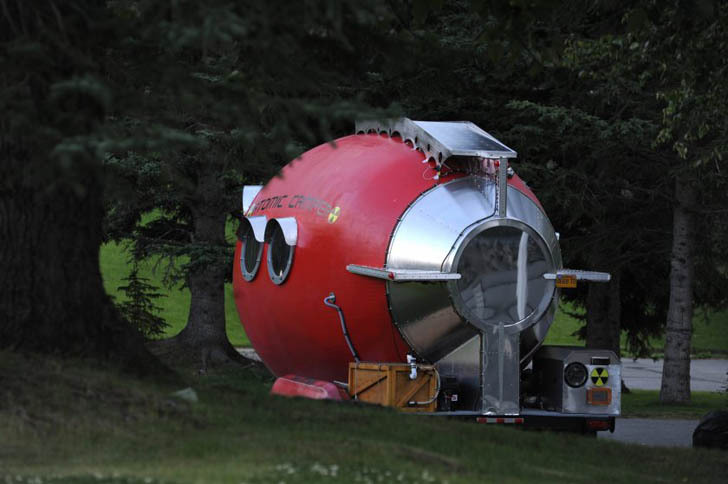 The base trailer appears to be a small boat trailer, retrofitted with a propane tank and some tie downs to hold the rocket ship camping module in place. 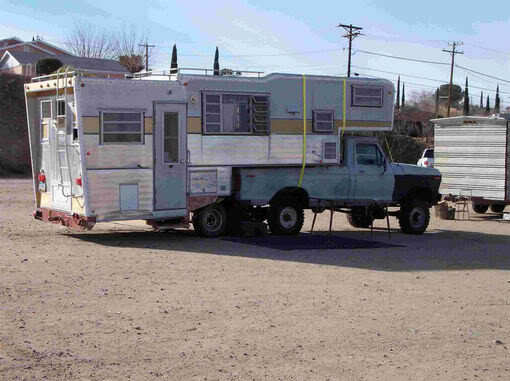 In its finished condition, the propane hoses and position on the trailer make this rocket camper appear like its ready for a camping mission to the stars. 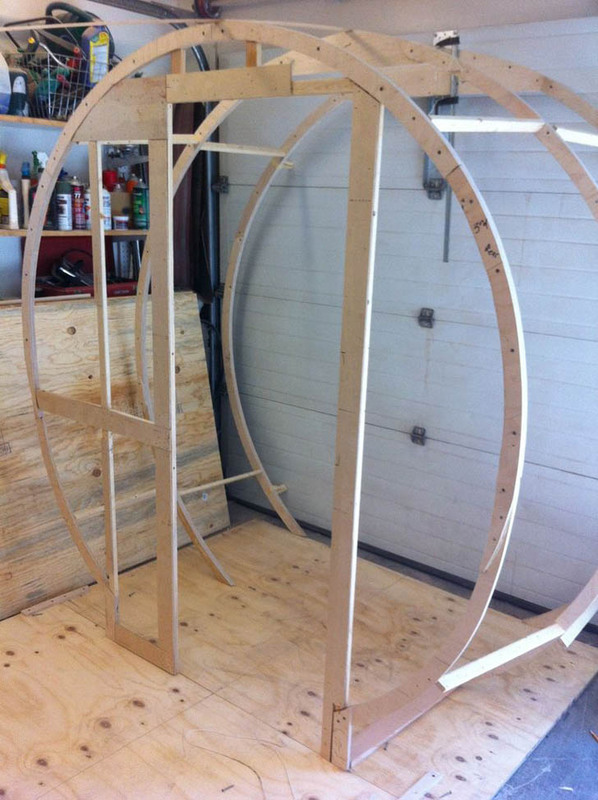 Plywood rib framing forms the skeleton. Thin strips of wood form the shape and provide a “lath” base for the skin. 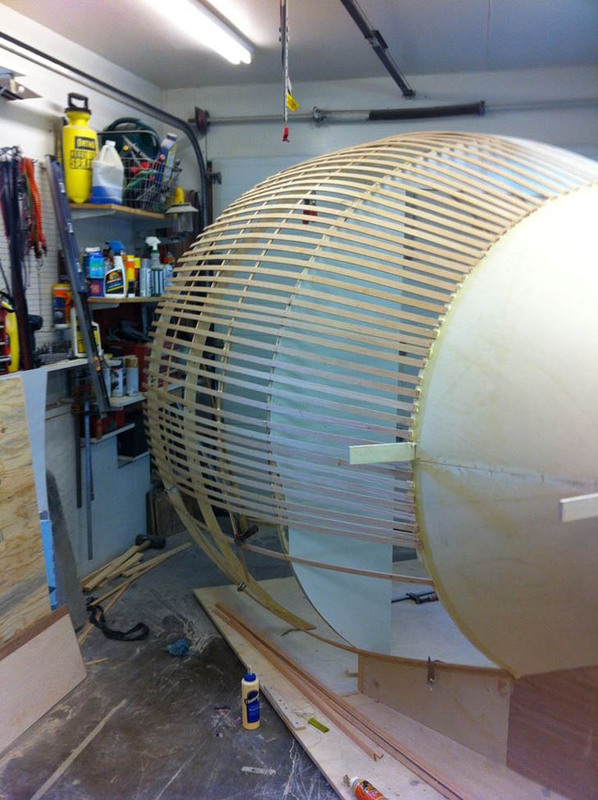 Construction started with a plywood-ribbed frame, similar to building a boat or canoe. 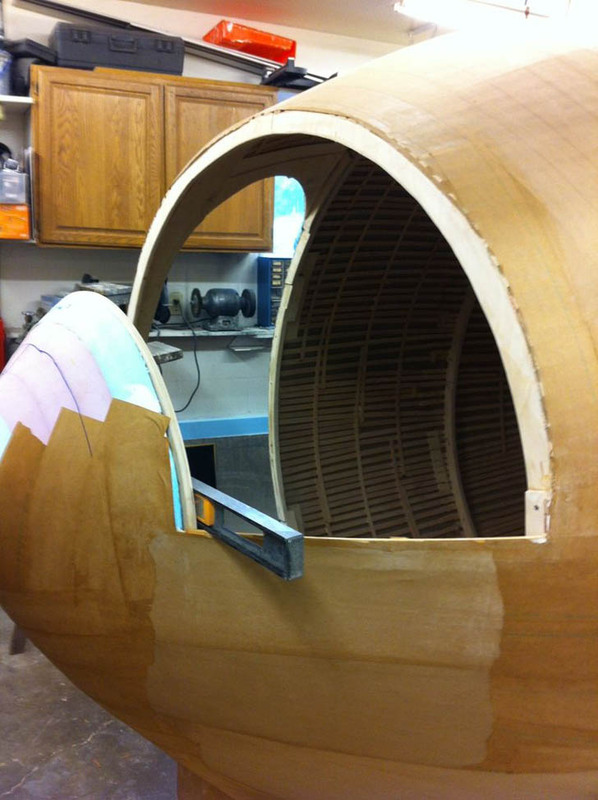 To get the geometry of the “football shaped” ellipsoid as close to perfect as possible, thin wooden strips were attached about an inch apart over the entire surface. The kitchen window and a look at the “paper mache” stage. The exterior “skin” is paper mache, with glass fiber matts and filler for a top coat. The inside is paneled in custom cut Luan plywood panel pieces. 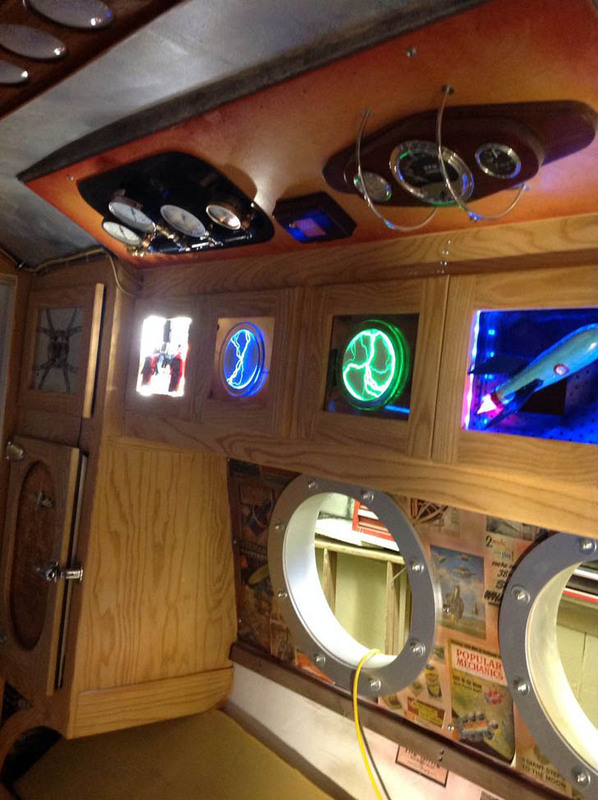 For windows, a front “windshield” which serves as a kitchen sink window, and six round portholes that captain Nemo would be proud of provide natural light. 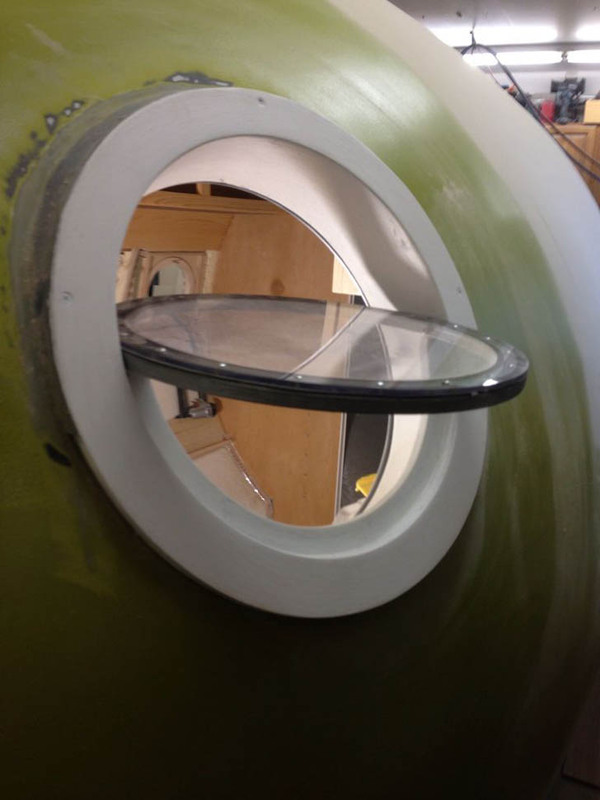 The portholes also “tilt” to open and allow fresh air, when the climate control is not in use. Tilting portholes allow fresh air to breeze in. Everything from the steampunk “fridge” door to the breaker panel that looks like something out of Doctor Who is custom built. 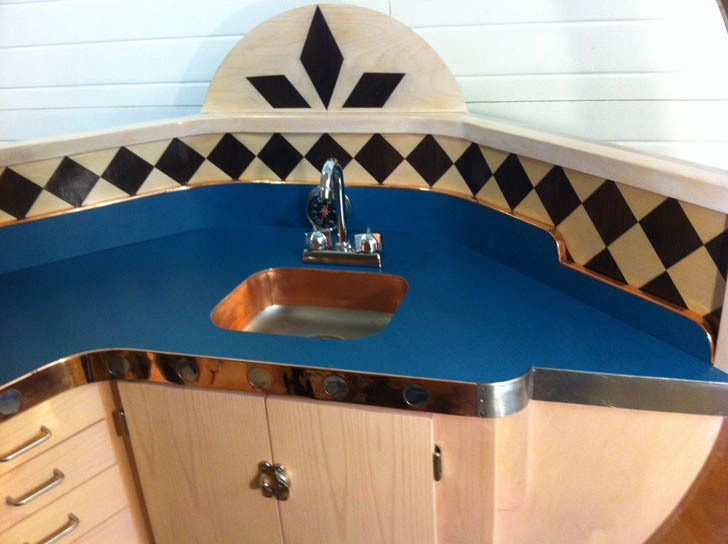 The kitchen sink is a work of art, combining tile work, laminate and copper trim. The cooking area sits in the nose of the camper and in addition to the copper edge banding, features a gorgeous wood marquetry backsplash in a diamond “harlequin” pattern. Builder Bill Guernsey, in front of the camper’s kitchen. Before you think the builder insane, Bill Guernsey was recovering from surgery and could not “work”. 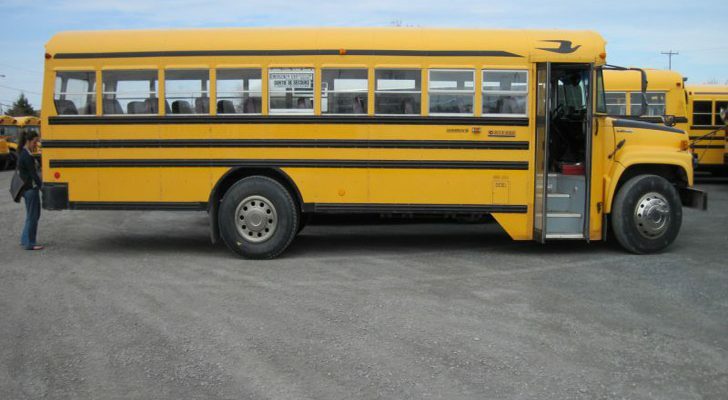 So for two years, this became his job – six hours a day, six days a week. 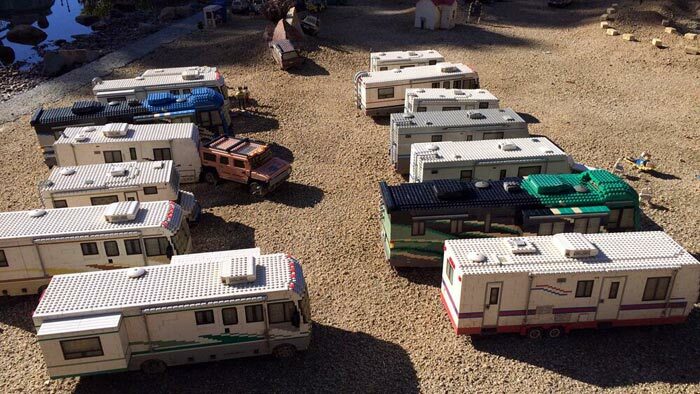 He says building the unique camper is what gave him the patience to add the detail that makes the “Atomic Camper” the masterpiece it is. This gorgeous kitchen sink sits in the rocket’s “nose”. 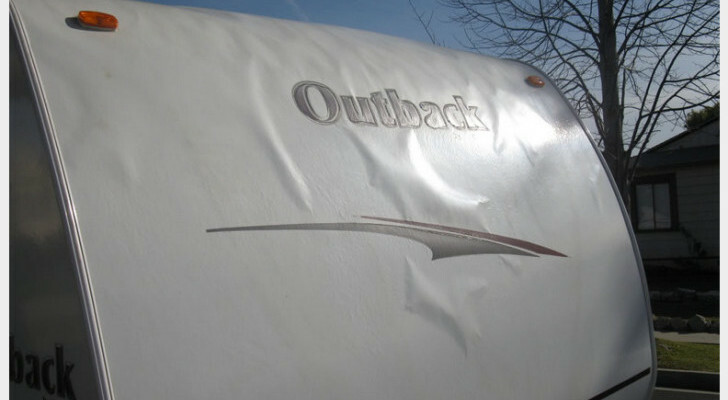 All surfaces except the floor – both inside and out – are curved. This had to make for some tough custom fitting when it came to the beautiful interior upper cabinets and cubbies. 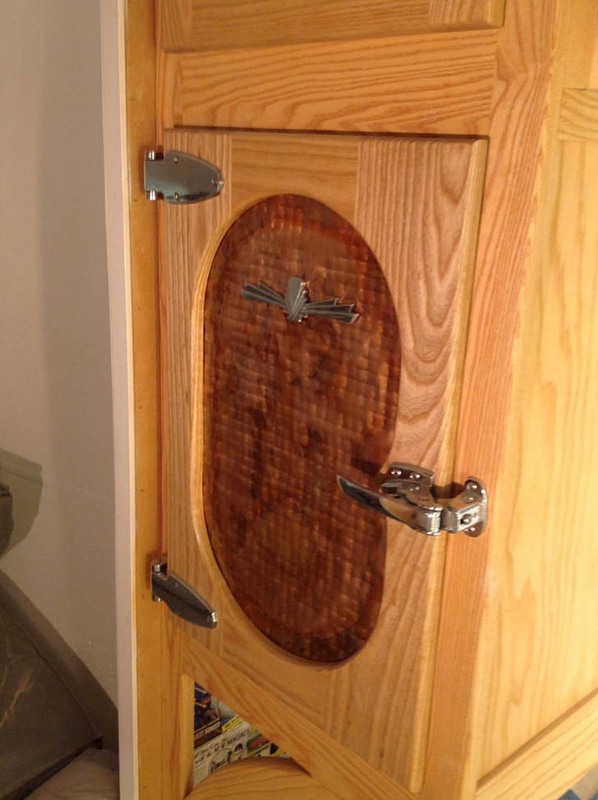 The inside is mostly wood tone, and is very reminiscent of a ship’s cabin. 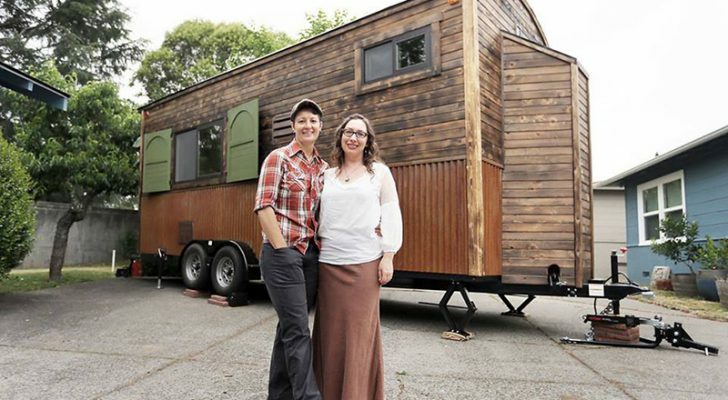 From stem to stern, this is one of the best realized DIY camper builds we have ever shared. Steampunk details inside the camper’s cabin. 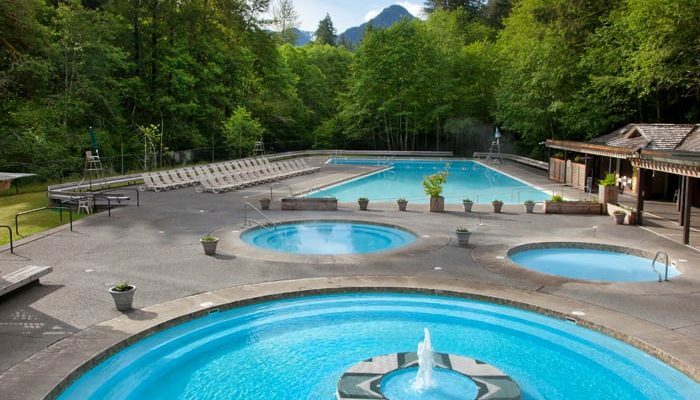 Over the course of the two years, Guernsey spent over $15,000 to see his vision come to life. Much of it he picked up from the Habitat for Humanity “Re-store” where recycled and overstocked building materials are sold to raise money for the organization. The “icebox style” futuristic fridge door. People there (at the ReStore) are really sweet. They see that stuff, and a lot of the times they’ll set it aside for me. It’s nice to buy stuff there because a lot of time you’ll wreck it or break it trying to make it work in the way it wasn’t meant to work. I like buying stuff there because you don’t feel bad when you break a $5 latch but feel terrible when you break a $150 latch. That gets old really fast. 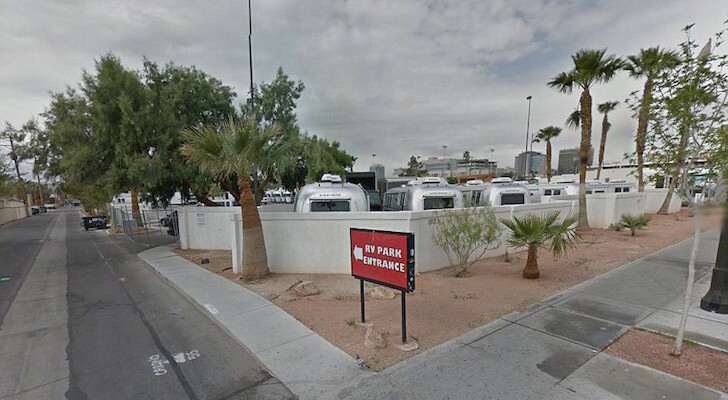 The Atomic Camper’s kitchen entrance. 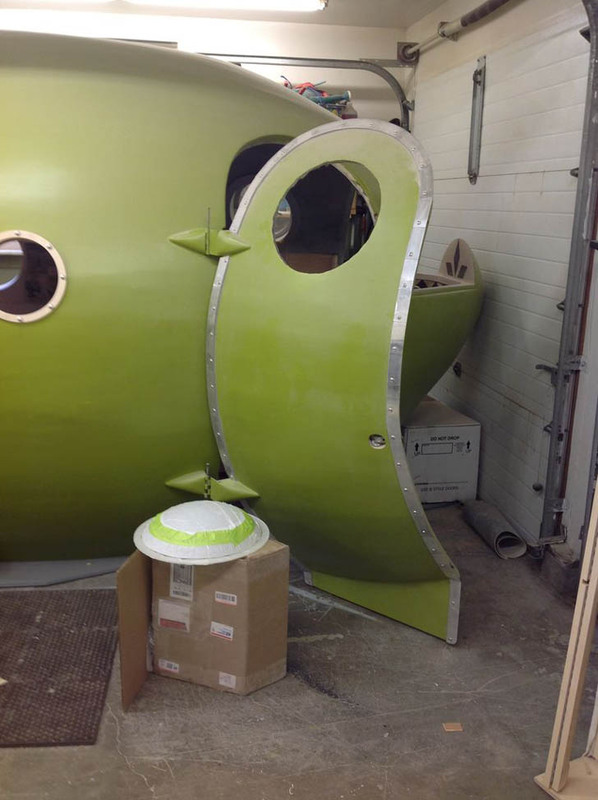 I want to build another camper — a 24-foot zeppelin. When I do it, I’ll do a lot differently — it’ll be a cylinder. I’ll stretch it. It will be longer and bigger. I want it to look like it’s manufactured. And it will have an infrared camera — to see the bear in the dark. Even making an exit this is one cool camper. 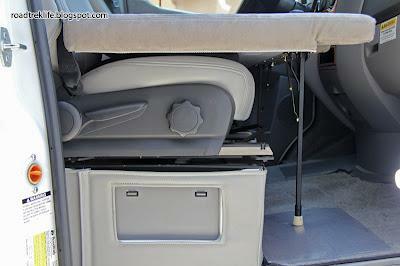 See lots more photos on Bill’s Atomic Camper Facebook page.